DC-Unlocker USB key (Full) is the new device to unlock PCMCIA cards. It's allows right now for unlock, read lock code and flash readign but soon will also free update for write flash. It`s first solution in the world to this kind of devices. Full version comes with 50 credits at start. 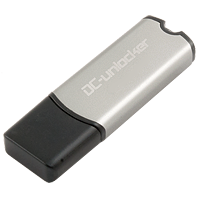 DC-Unlocker USB key LITE is the new device to unlock USB and PCMCIA modem cards. It's allows right now for unlock, read lock code and flash readign but soon will also free update for write flash. It`s first solution in the world to this kind of devices.